Beyond the ladies listed under Historic Reenactment, many Worcester women have been lost– especially if no one notes their passing. 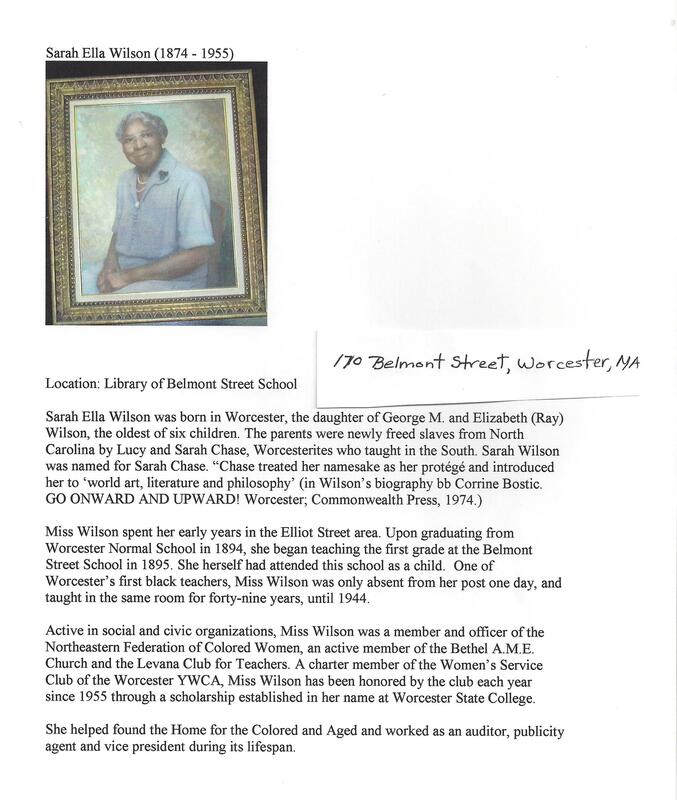 This body of names was collected as part of the Worcester Women’s History Project search for women who made a difference in their community and is by no means complete. Much more research is needed! Obituaries celebrate the lives of women. This emphasizes the importance of sharing one’s own life with family members as a model for future generations. 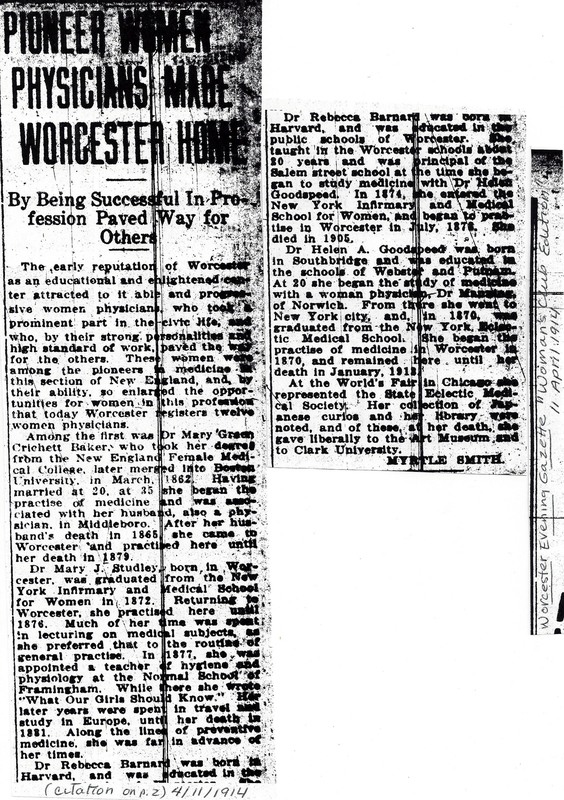 Clues and leads also came from many sources like this 11 April 1914 article in the Worcester Evening Gazette “Women’s Club Edition” by Myrtle Smith where we discover Dr. Mary Green Crichett Baker, Dr. Mary J. Studley, Dr. Rebecca Barnard and Dr. Helen A. Goodspeed. 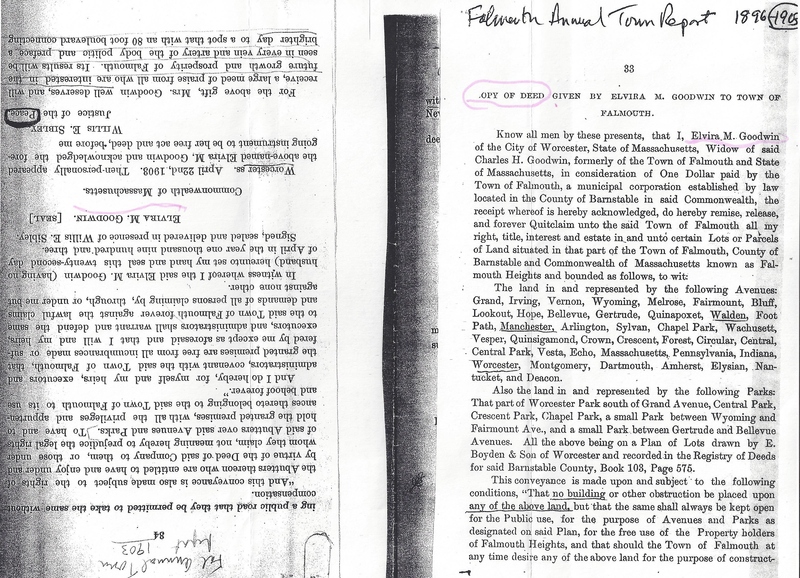 From Norma Feingold’s Woman’s Work: The Worcester Experience, 1830-1916. Worcester Historical Museum, 1986. 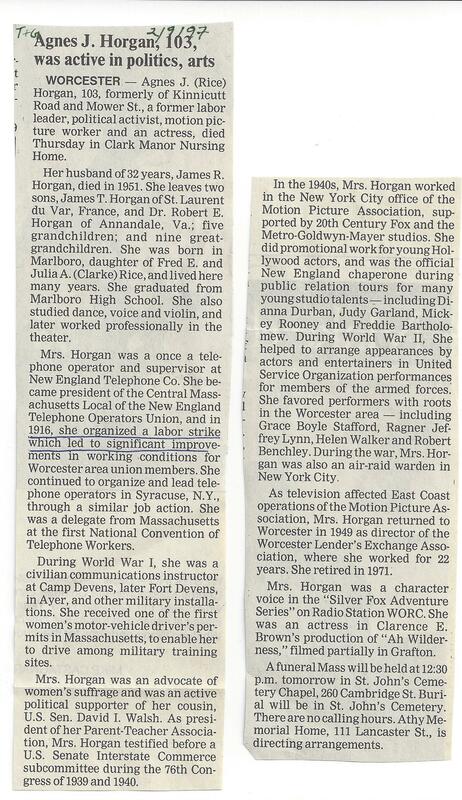 Many wonderful women are briefly mentioned in Norma Feingold’s Woman’s Work: The Worcester Experience, 1830-1916. Worcester Historical Museum, 1986 like Anna C. Freeland (1837-1911) – painter, sculptor and teacher later worked from her studio in Jackson, NH. For many years she ran the summer Boston Art School, concentrating on the watercolor classes. White Mountain Art & Artists at witemountainart.com/Biographies. 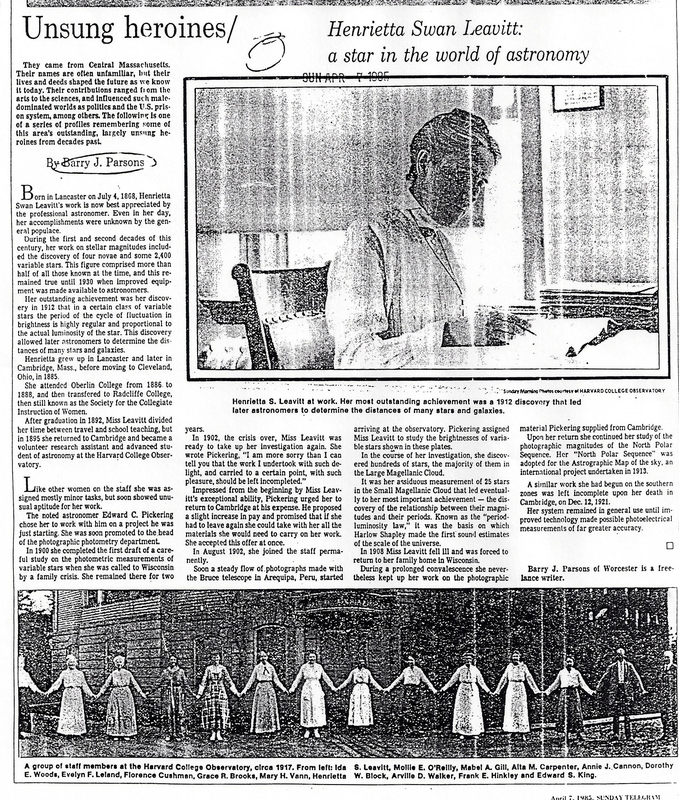 When you let others know you are looking for Worcester women of the past, friends become aware of the wide reach of women in their communities and others like Elvira M. Peck Goodwin (1832-1917) – hotel co-owner and manager, prosperous builder’s wife deeded extensive lands and park to Town of Falmouth, MA. 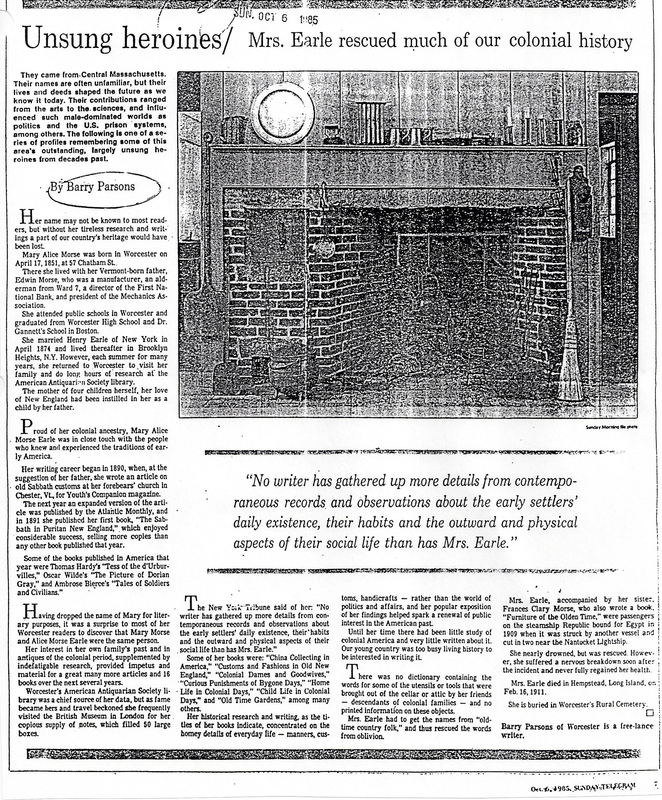 Newpapers are wonderful at keeping the past alive by celebrating the movers and shakers in the community such as Mary Alice Morse Earle (1851-1911) – wrote about America’s colonial history. 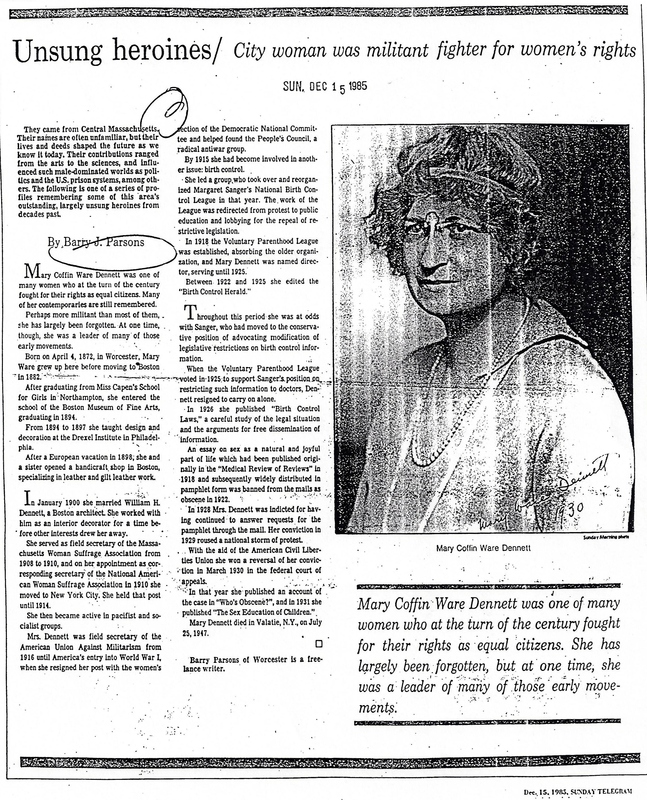 Mary Coffin Ware Dennett (1872-1947) – teacher of design and decoration; opened handicraft shop in Boston; field secretary for Massachusetts Woman Suffrage Association and then for the National American Woman Suffrage Association; director of the Voluntary Parenthood League. See Barry Parsons’ article “Unsung heroines”. Worcester Sunday Telegram, 15 December 1985. Sarah Goodridge (1788-1853) – painted miniatures of many early leaders. 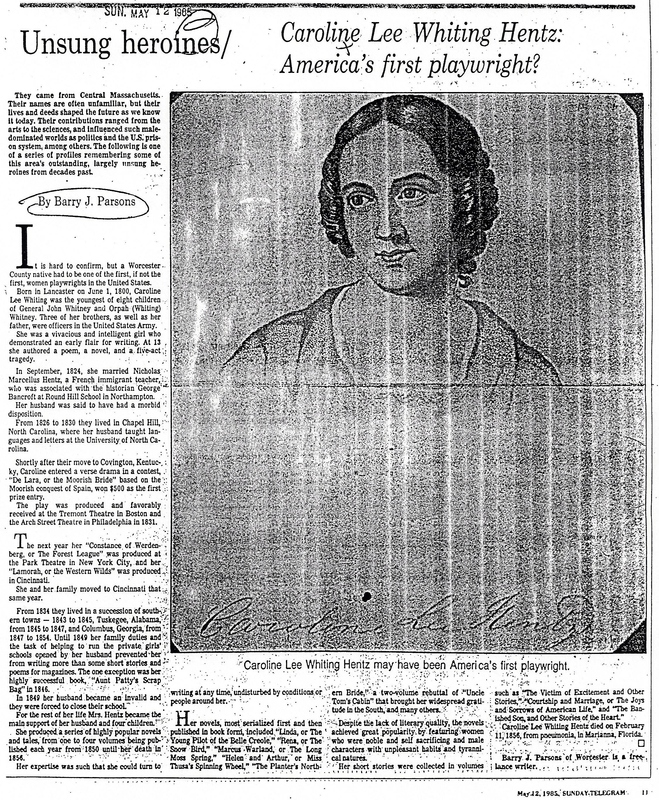 Caroline Lee Whiting Hentz (1800-1856) – May have been America’s first playwright. See Barry Parsons’ article “Unsung heroines”. Worcester Sunday Telegram, 12 May 1985. Alice Coonley Higgins (1906-2000) – Clark University’s first female trustee and possibly first female chair at a university; athletic; civic-minded mother. 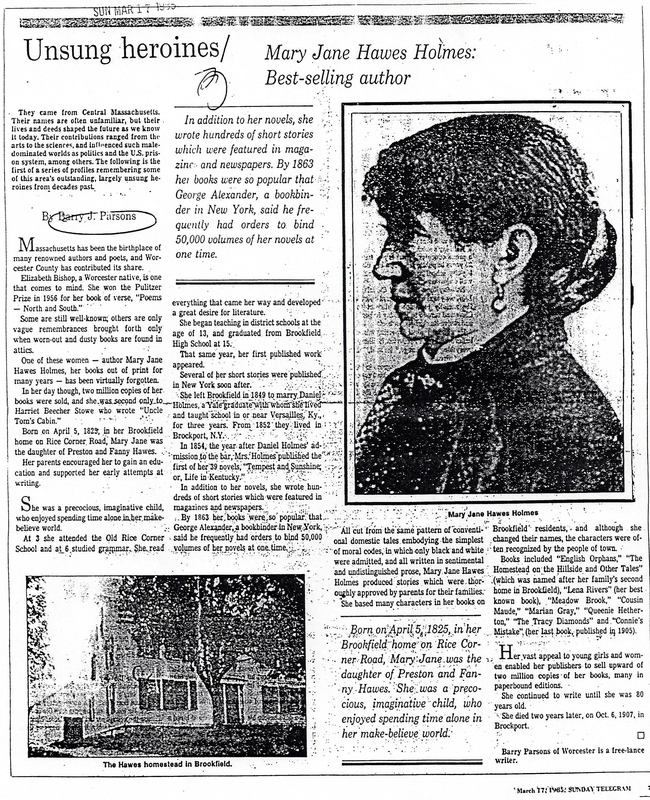 Mary Jane Hawes Holmes (1825-1907) – Best selling author from Brookfield, MA; taught at age 13. See Barry Parsons’ article “Unsung heroines”. 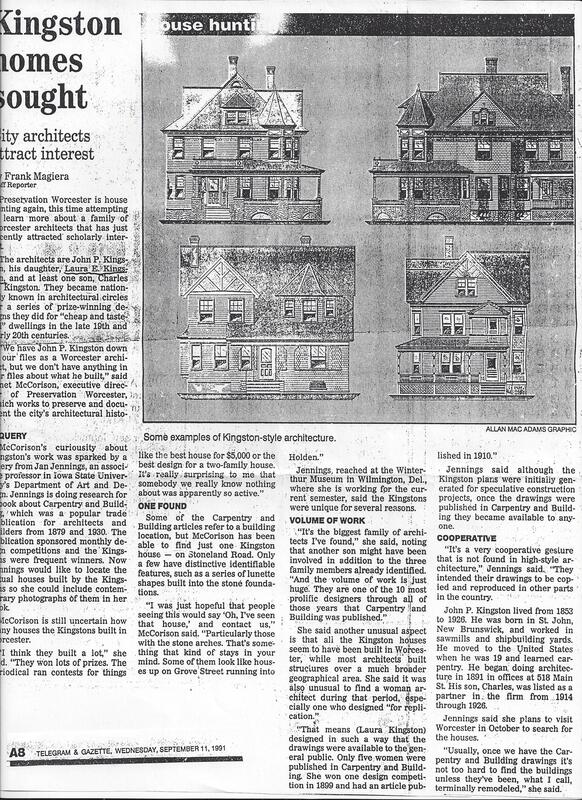 Worcester Sunday Telegram, 1985. Agnes J. Rice Horgan (1906-1997) – labor leader, political activist, motion picture worker and actress. “Operator, Get me Worcester” in Albert B. Southwick’s Once-Told Tales of Worcester County (Worcester, MA: Databooks, 1994) tells of the arrival of telephone in Worcester. 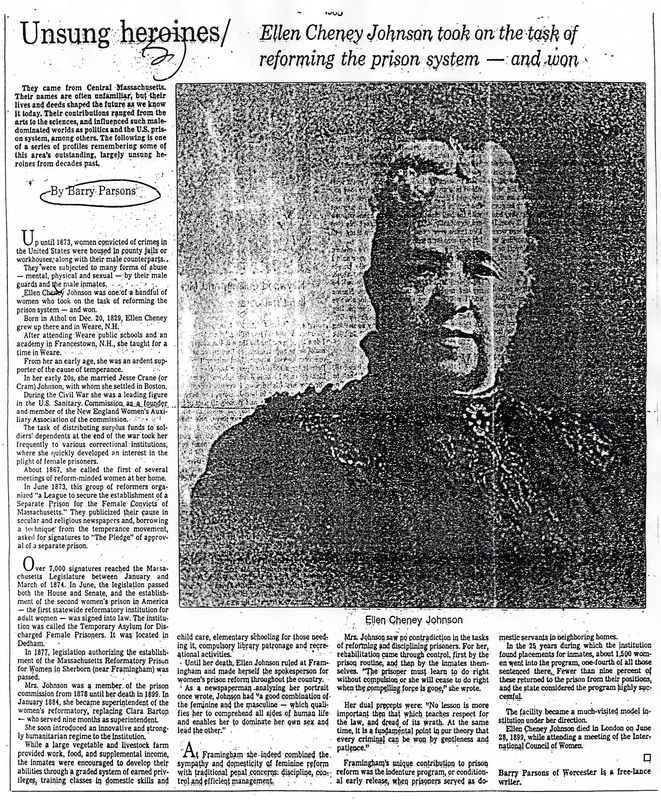 Ellen Cheney Johnson (1829-1899) – reformed the prison system; leading figure of U.S. Sanitary Commission during Civil War. 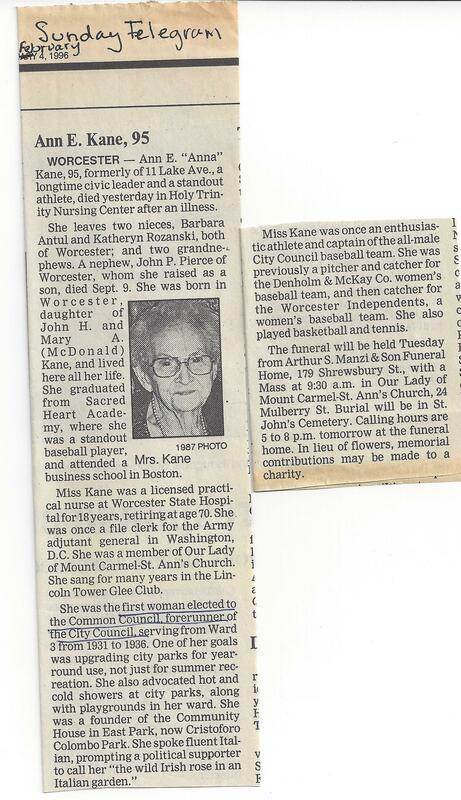 Ann E. Kane (1901-1996) – licensed practical nurse; standout athlete; civic leader; first woman elected to the Common Council, forerunner to Worcester City Council. Laura E. Kingston (1879- ) – Worcester architect. 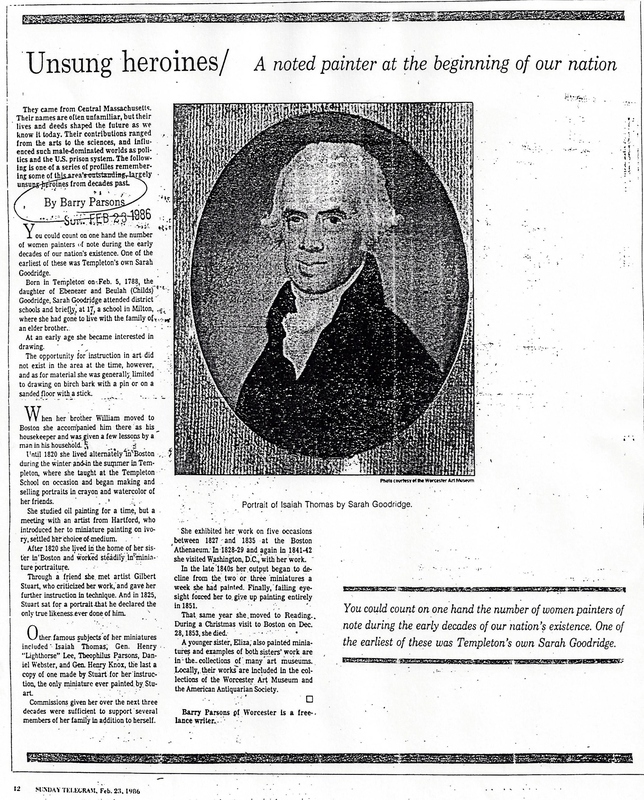 The article shown here is incorrect in describing Laura’s father at John P. Kingston. John is Laura’s uncle. Her father is George Kingston. 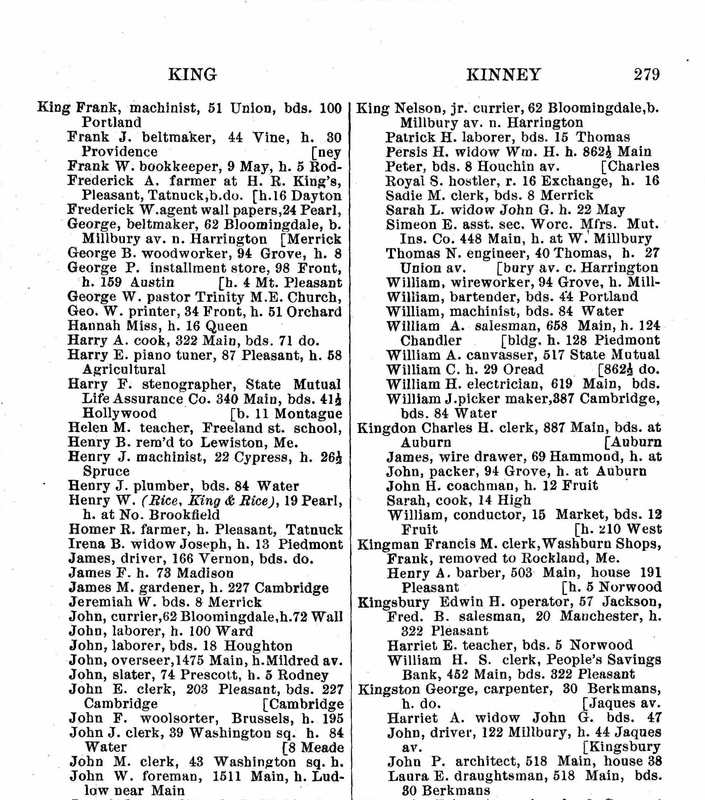 Laura is listed in Worcester City Directories from 1899 to the 1920s as a draughtsman. John P. Kingston designs. 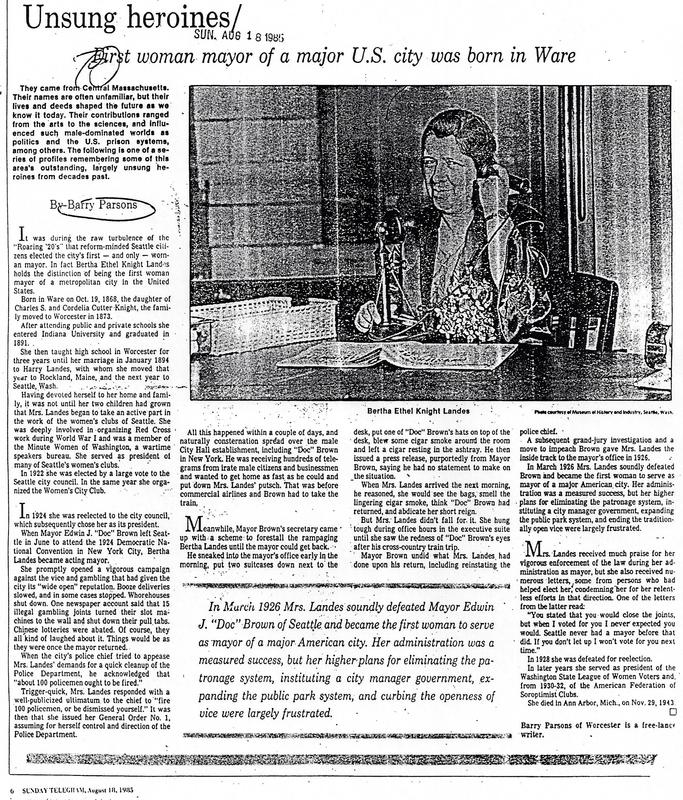 Bertha Ethel Knight Landes (1868-1943) – First woman mayor of a major U.S. city (Seattle); taught in Worcester until her marriage. See Barry Parsons’ article “Unsung heroines”. Worcester Sunday Telegram, 18 August 1985. 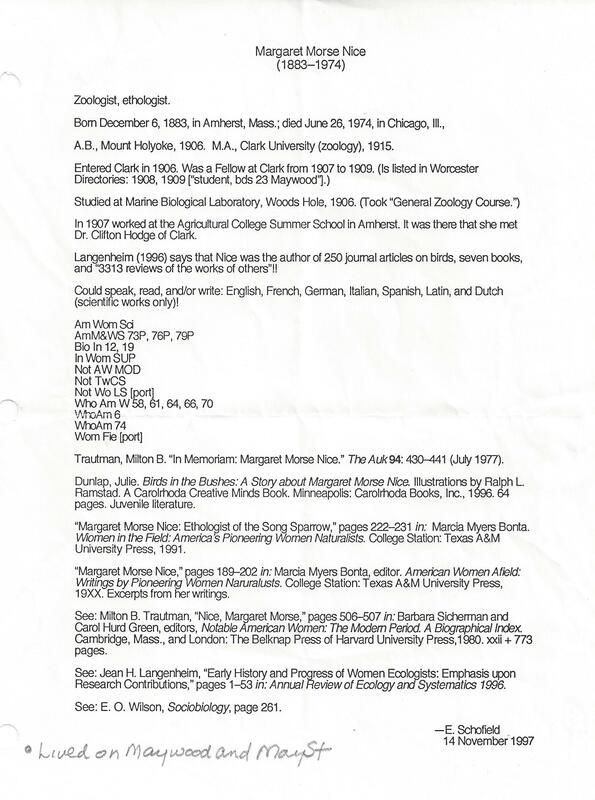 Margaret Morse Nice (1883-1974) – naturalist and author; lives on Maywood and May Street in Worcester, MA. 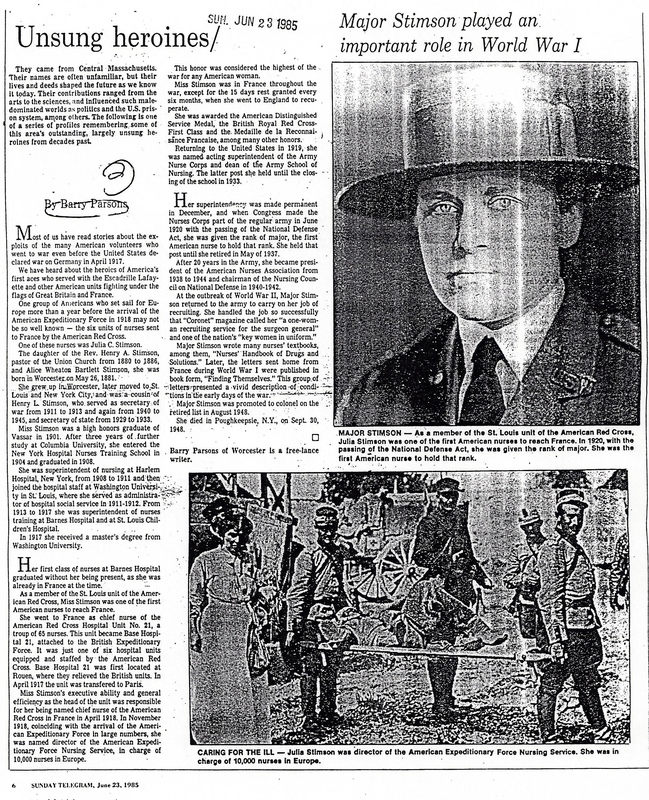 Julia C. Stimson (1881-1948) – first American nurse to hold the rank of major; one of the first American nurses to reach France in World War I. See Barry Parsons’ article “Unsung heroines”. Worcester Sunday Telegram, 23 June 1985. 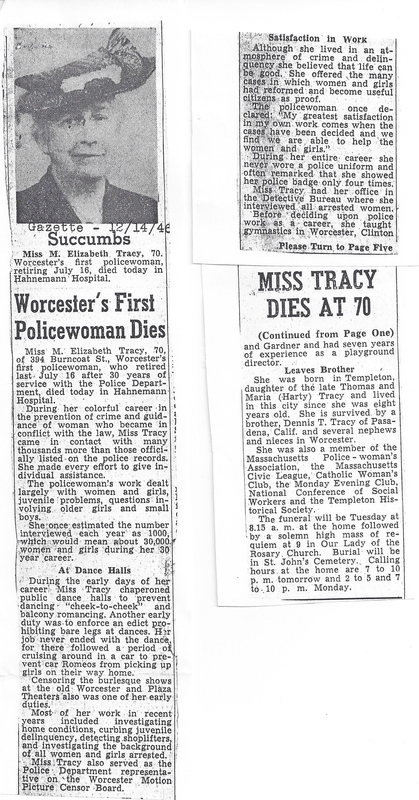 M. Elizabeth Tracy (1876-1946) – Worcester’s first policewoman; gymnastics teacher and playground director. Visit Worcester Historical Museum Library for more information. Martha W. Tyler (c. 1830- ) – author of A Book without a Title: or, Thrilling Events in the life of Mira Dana (1855-56); lived in Worcester in 1840s and 1850s where her book was written. Article by Judith A. Ranta in Legacy, Vol. 21 (Lincoln, NE: University of NE Press, 2004).